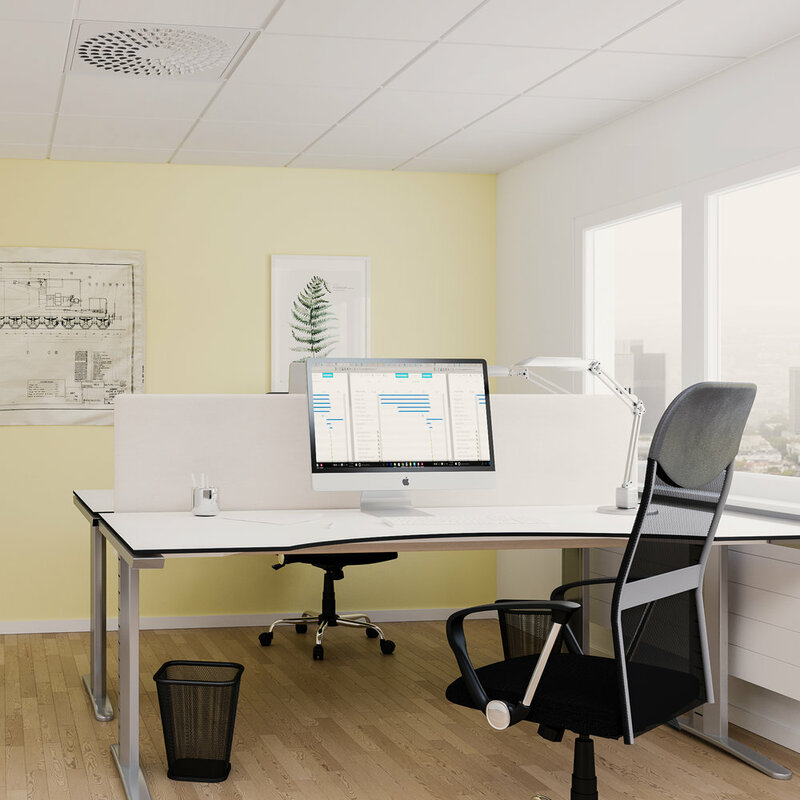 This range of modular ceiling diffusers has been designed with all parties in mind, to be as cost-effective as possible and to ensure that from installer to end user, the diffusers are high performing, comforting to the end user and simple to install and maintain. The Ceiling Collection range consists of 5 different diffusers, to cater to a variety of applications, whilst maintaining a high level of performance and comfort. The positioning and direction of the discs on the EAGLE and COLIBRI faceplates can be easily rotated, to cater to the needs of the room and its occupants. This changes the spread pattern without affecting air flow, pressure drop or sound level, ensuring a consistent level of air distribution with minimal sound. Ceiling Collection diffusers have been designed to simplify installation and reduce time spent on site commissioning diffusers. All diffuser faceplates are manufactured with hinges that clip smoothly into the backing box and holds the diffuser face securely to the box. The face is easily installed and unhinged to enable maintenance personnel to access inside the ductwork when necessary without having to fully detach the faceplate from the backing box. The faceplates are so lightweight and simple to use, they can be replaced and changed easily and regularly using the unique Quick Access card. Only one person is required for this - an installer's and building owner's dream! Faceplates have been designed so that the diffusers can handle large temperature differences and lowest possible sound levels. Most evident in the LOCKZONE and COLIBRI, their swirled shape and slot positions allow for a large range of air temperatures to pass through, whilst maintaining an even distribution of air into a space and resulting in optimum air quality. The ALS Commissioning Box has an exclusive design for the Ceiling Collection, to make installation as simple as possible. 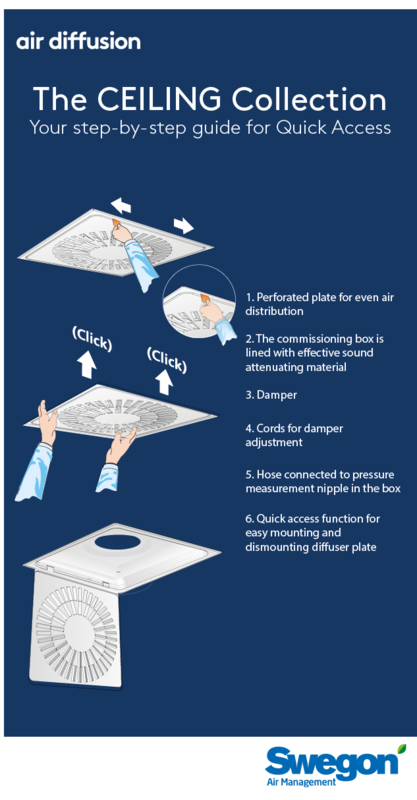 The box has been designed to allow true 360°C rotation so that the box can be fitted to the diffuser from any direction - making the most of increasingly small and complex ceiling voids. The ALS and the diffusers can be fitted in a large range of ceiling types and sizes, increasing the scope for installation possibilities and keeping the installer's job simple and quick. Quick access function for easy mounting and dismounting diff user plate.